When Ian Gill and James Reynolds co-founded Silvergate Development in 2010, it wasn’t easy to build the middle market housing that is the San Diego firm’s hallmark. It hasn’t gotten any simpler. Silvergate has nevertheless developed approximately 900 housing units in 11 projects since 2010. Gill said there even has been major pushback when it comes to building density along the Morena Boulevard corridor, which is known more for its clash of commercial uses than what is being conceived as a walkable mixed-use village. “If you can’t develop a high-density residential project there, where on Earth can you put it?” asked Gill, before expressing concern that if San Diego doesn’t develop its fair share of housing, the state will end up dictating where that housing will be built. The veteran developer said it tough building middle-market housing in an era with more regulations, no redevelopment agencies, high land and construction costs, high developer impact fees, and opposition groups battling anything that would increase density. Gill said development costs that may have been $200,000 per unit in 2015, are as high as $320,000 per unit now. Gill emphasized that processes must be made easier and less expensive if affordable, non-subsidized housing is to be built at all. “We must find a way to build a better mousetrap,” he said, adding that even with single-loaded stacked flat units in three-story structures, it is still possible to develop to a density of 30 to 40 units per acre. Gill and Reynolds have found a way to develop despite these issues, and have become masters of infill development. Silvergate specializes in the development of infill middle-market housing, ranging from 50 to 150 units. Gill has more than 40 years of experience in real estate development, home building, and general contracting. His diverse background encompasses residential, commercial, industrial, institutional and mixed-use projects with an emphasis on urban and redevelopment projects. During his career he has developed and built in excess of 5,000 multi-family residential units. Gill said one of the most daunting problems in putting housing within reach of the middle class are the impact fees that vary widely depending on which of 19 jurisdictions in the county the site is located. What’s more, the fees may be different from place to place within those jurisdictional boundaries. Gill said San Marcos has impact fees that amount to about $35,000 a unit, and Vista has an impact fee of about $18,000 per unit. Chula Vista has $33,000 in impact fees as well, according to Gill, but the South Bay city has agreed to amortize many of the fees over the next 20 years. Without some creativity, Gill said what little middle-market rental housing that exists could disappear. As a result of fees and the other factors, Gill said the rents he needs to charge have gone up from $1,350 and $1,750 a month in 2015 to $1,750 and nearly $2,000 a month today. “San Diego’s inclusionary or in-lieu fees have gotten so high that it’s difficult to make a project pencil,” he said. Silvergate is making projects work by being creative. In a couple of instances, the developer is building on what had been a failing retail center. Two examples are Vista Creekside, a 41-unit apartment project in Vista, and Breeze Hill, an 88-unit development in Vista, too. “We used mixed-use housing to prop up failing retail,” Gill said. Leasing is ongoing at Vista Creekside while the Breeze Hill Apartments are slated for completion in May. 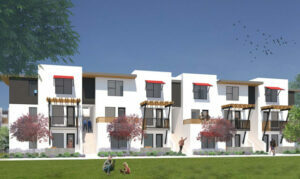 Silvergate is developing two projects in La Mesa: Little Flower Haven, a 130-unit multifamily apartment complex that is under construction; and El Cajon Blvd., a 74-unit mixed-use townhome that is under construction. The real estate firm completed 51 Baltimore, a 66-unit apartment building in La Mesa, in October 2017 and sold The Quarry, a 60-under multifamily complex in La Mesa in October 2016. Silvergate also is developing three multifamily apartments in Chula Vista, including Bonita Glen, a 170-unit complex that is in the entitlement phase. Both 230 Church, a 29-unit building, and 260 Broadway, a 62-unit complex, are slated to begin construction March 1.